“Do You See Me” Sean McLeod and the Kaleidoscope Dance Theatre shared a powerful message of Inclusion in New York City. A premier, this new dramatic, dance, and musical production helps explore the responsibly of those who allow the “isms” to exist. All of Us. “Do You See Me” taped for a larger online audience engaged people in an important dialogue through movement, song, powerful commentary, and conversation. 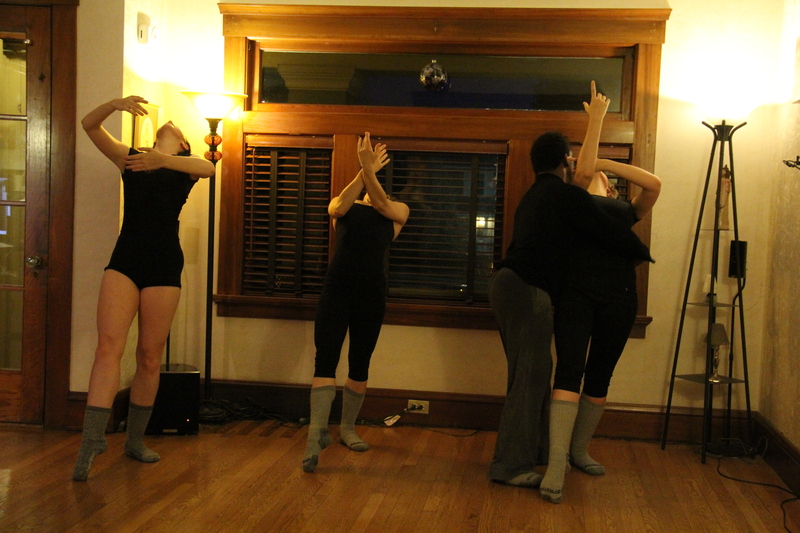 This dance work was performed as part of this work. “For Ladies” is a work choreographed by Sean McLeod to highlight the strength of women in a society often dominated by men. Their work, voices, and contributions have not and will not go unnoticed. Without women, men would cease to exist. This fall, in light of recent events, Sean has launched the “Mission for Inclusion” within the multiple companies he runs. The goal is to address the lack of diversity and economic inclusion many communities, institutions, and corporations face, as well as to help everyone within earshot understand how they can contribute to the “Possibility of Yes”. International Producer and American Choreographer Sean McLeod debuted two movements of his new work “Return to Eden” while on tour in Italy. Mr. McLeod was invited as a US dance company and dance master for the Stage Internazionale Di Danza in Valdagno, Italy. The first work “Beginning of Eden” features Kierstyn Zaykoski and Sean McLeod. The second piece “Return to Eden” was workshopped at the New York Dance Festival and performed in the concert by the Kaleidoscope Dance Theatre. The international concert was produced by Italy’s Marta Mettifogo, USA’s Lorienne Beals, and England’s Amber Perkins with proceeds benefiting the Red Cross! International Producer and American Choreographer Sean McLeod works with Applied Study Candidate Symphony Quencer to fulfill a back cambré as she dances alongside NYIDE Product Director and Kaleidoscope Dance Theatre Second Soloist Kierstyn Zaykoski and KDT Apprentice and Applied Study Candidate Chelsea Blakeburn on the first day of the 2015-2016 Applied Study Program. 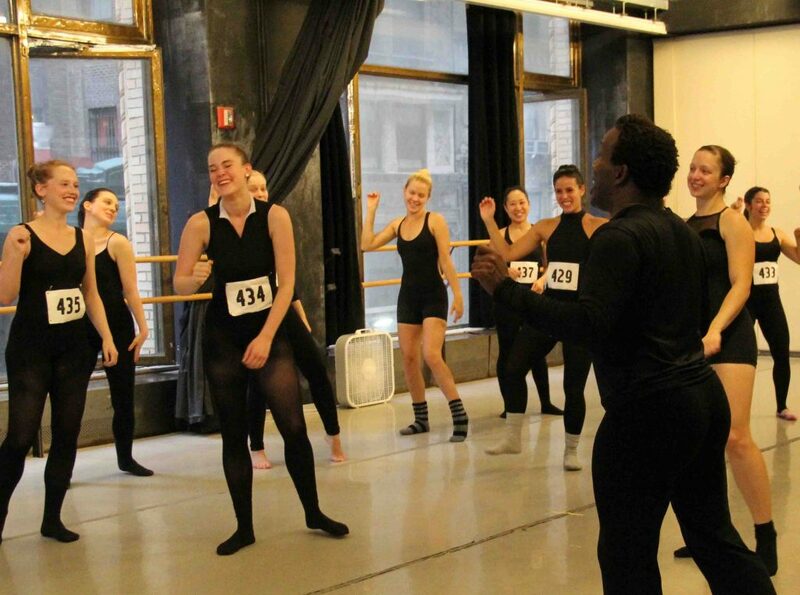 One of the most unique aspects of the New York Institute of Dance & Education’s Applied Study Program is its direct access to people of note in the world of dance and business coupled with the invaluable information that is not only taught, but then encouraged to be applied which allows the candidates to learn a treasure trove of information throughout the course. On Tuesday, KDT Apprentice & Applied Study Candidate Chelsea Blakeburn and Applied Study Candidate Symphony Quencer gained a new measure of access as they sat in International Producer and American Choreographer Sean McLeod’s Private Studio alongside NYIDE Product Director and McLeod Technique Certified Personality Kierstyn Zaykoski, German Choreographer and NYIDE European Liaison Gregory Livingston, and Sean McLeod himself to begin the 2015-2016 Applied Study Program and MT Sessions. The master class now up and moving worked through a Movement Integration series that took normally static exercises like pliés, relevés, and tendus and articulated them into action so that the dancers could understand how to make these elements useful. After going through the first series once, which to an outsider might have appeared seemingly “simple,” the candidates were sweating hard and loving every minute. The focus was not on the steps (though correct alignment was stressed), but rather on the intention behind the steps and carrying the “fashion of performance” throughout making each step simply real—not just an exercise or combination. International Producer and American Choreographer Sean McLeod encourages Symphony Quencer (Candidate of the Applied Study Program) to wear the “fashion of performance” instead of simply doing the steps as she dances alongside NYIDE Product Director Kierstyn Zaykoski (front), Applied Study Candidate & KDT Apprentice Chelsea Blakeburn (left) and Stephen & Sean Murray, who also study in the MT Sessions weekly as part of the Family Mediation Program through the Institute. International Producer and President of Kaleidoscope Dance Theatre reinforces KDT Soloist Hana Ginsburg Tirosh in a parallel penché, giving her the tools to be a dancer with technical grace and an emotional signature. On Wednesday, Hana honed in on a movement integration series that Sean taught her the week before, highlighting the physical work that goes into constructing dance that is emotionally honest. She worked one-on-one with NYC Professional Dancer Ruth Rae, who had also shared in learning the combination from Sean. Because Ruth had been in the room when Sean set the intention of this series, she had an advantage that many of the other dancers did not: information! What Ruth lacked initially in class was the courage to use that which she already knew. Sean iterates often that “if you have the correct information but you don’t use it, then you do not get the benefit of having it.” Hana quickly helped Ruth to recalibrate how to employ her pre-existing knowledge by asking Ruth to teach Hana the combination. By verbalizing the movement (and using a strong voice! ), Ruth demonstrated with confidence that her wealth of information was greater than she imagined. And Ruth learned to be more formidable in the process! International Producer and American Choreographer Sean McLeod works with NYC Professional Dancer Ruth Rae on applying the expert knowledge already in her possession. NYC Director of the New York Institute of Dance & Education Hana Ginsburg Tirosh encouraged NYC Professional Dancer Ruth Rae to find the joy of information during a McLeod Technique Open Class in NYC. Here, the heel presses forward, the legs rotate from the top of the hip, and the face is expressive. During the Friday morning class, Hana’s focus on emotional intention brought the class to another high point. The robust physical warm up was actually an exercise in being emotionally warm. During one portion of the class, the dancers had to ascend and descend from relevé for a good ten minutes. Their muscles were burning, but instead of giving out or giving up, the dancers looked at each other and smiled! Encouragement and inspiration started flowing in the room. Conversations between eyes and eyebrows said, “You got this! We can make it!” Such a small gesture has huge ramifications. 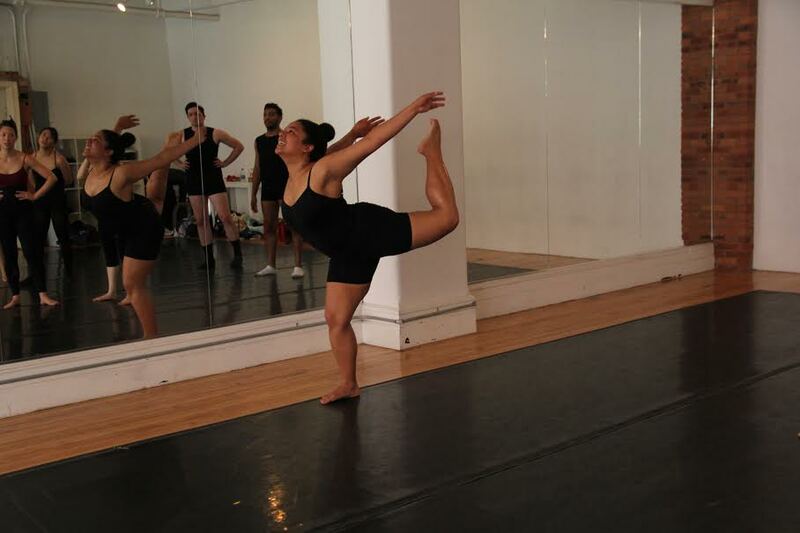 With the Kaleidoscope Dance Theatre, who you are as a person is vital to your lifespan in the company. Every dancer in every company will endure grueling physical drills; how many of those places will leave you feeling uplifted in the process? That emotional fortitude is the netting that meshes the company together as friends and family, that catches us with grace when we fall. 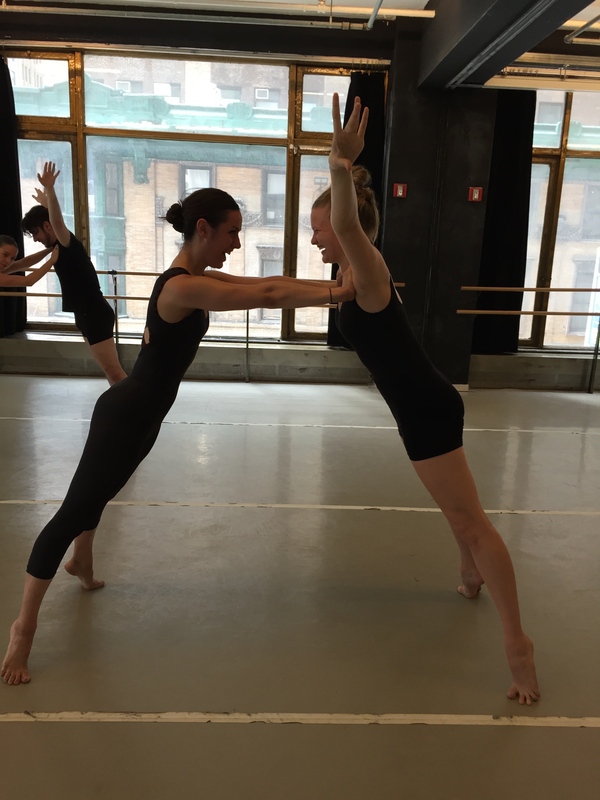 Kaleidoscope Dance Theatre Company-In-Training Members Jessica Davis and Sarah Warren embrace KDT Apprentice Jill Michalsky (center), in a candid moment mid rehearsal. These are ties that bind! We as a company are so incredibly grateful to Hana Ginsburg Tirosh for sharing her wealth of knowledge in the classes she has been teaching since January. We are excited to welcome back our sister, NYIDE Senior Associate and KDT NYC Rehearsal Director Devon McLeod, after studying and working abroad in Prague, Czech Republic this past spring! Devon, an MT master, will be at the helm of MT Open Classes as we head into the fall our 25th Anniversary Season. NYIDE Senior Associate and NYC Rehearsal Director of KDT, Devon McLeod lives her happy happy joy joy in an MT Afro Hip Hop class in NYC. Join Devon McLeod and the rest of Kaleidoscope Dance Theatre for MT Open Classes this week! Kaleidoscope Dance Theatre Company Members learned from the Executive Team about the business, design, and communication, that goes on behind all the dancing with which they are familiar. A great opportunity wrapped in the bridge being forged between Upstate and NYC Dance. This week, several Kaleidoscope Dance Theatre Company Members traveled from NYC to Auburn, NY to work with the American Choreographer and New York Institute of Dance & Education President and CEO, Sean McLeod, at the company’s upstate base of operations. NYC Director of NYIDE Hana Ginsburg Tirosh, NYIDE Junior Associates Chelsea Blakeburn and Joseph Akin, NYIDE Associate Ruth Rae, and KDT Company Apprentice Jillian Sawyer all came to spend time in Auburn. KDT, which is about to launch its year long 25th Season Anniversary Tour, calls both NYC and Auburn home! 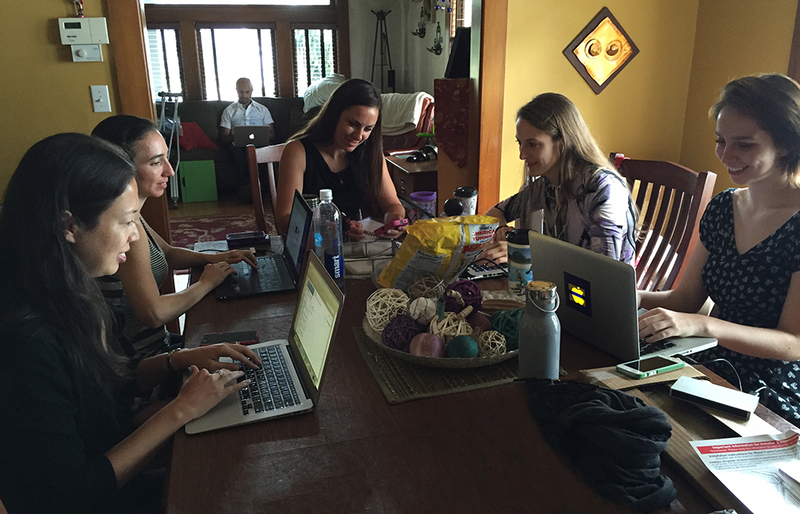 In Auburn, the dancers delved into the business side of NYIDE to learn administrative skills side by side with members of the Executive Team. When working with Sean, one must be multi-faceted: business mind, dancer, writer, videographer, editor, and more. You learn to solve problems easily by making decisions based on emotional integrity, garnering the best outcome for all and for the right reason. The company firmly believes that “no deal is a big deal!” and the visiting company members learned that attaining that mindset is possible when you’re surrounded by such extraordinary individuals running a multi-national corporation with so much acceptance and fun! 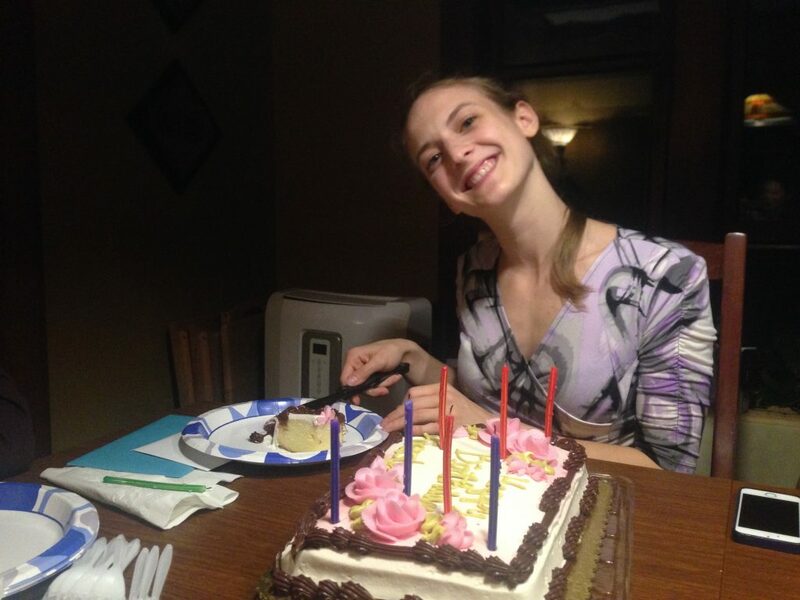 NYIDE Product Director and KDT Second Soloist Kierstyn Zaykoski cutting the first slice of a beautiful surprise birthday cake that she received from Anita Tuccillo, Gregory Livingston, Sean, the Executive Team, and fellow Company Members! Kaleidoscope Dance Theatre/Sean McLeod Dance Experience is not going to miss a chance to celebrate Company Apprentice Kaley Pruitt Ozminkowski on her July nuptials to Dan Ozminkowski! Kaley and Dan spent several weeks honeymooning through the great National Parks of the US and returned to New York to celebrate with Dan and Kaley’s family and friends in Skaneateles, NY, just a five minute drive from Auburn. Celebrating one another is what it means to be a member of KDT/SMDEx, whether you are Company-In-Training or a Principal Member. Joining the company means wanting to have a tangible relationship with the women and men that you dance with for the next twenty-plus years. 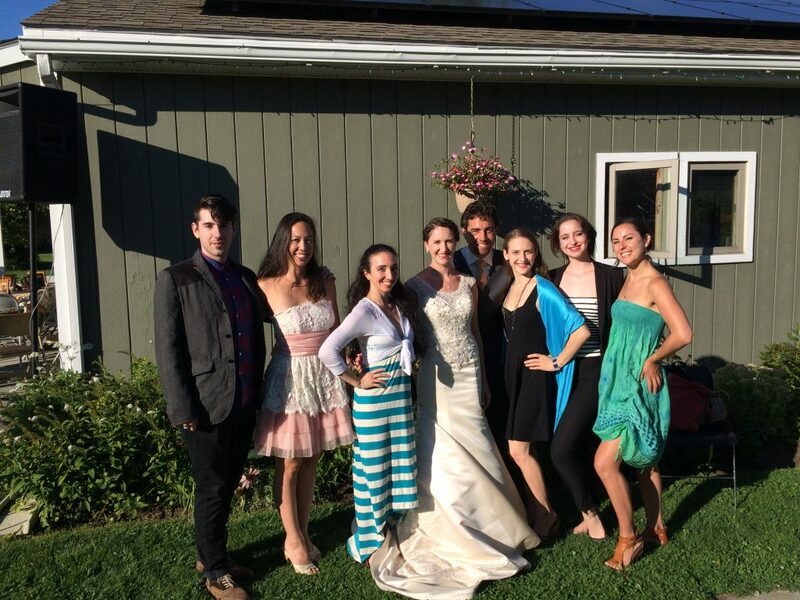 A few of the Kaleidoscope Dance Theatre Company Members take a moment to share smiles with company sister Kaley Pruitt Ozminkowski and husband Dan Ozminkowski at the New York Celebration of their wedding that took place in July in Idaho. Sean graciously opened his home to the company for the duration of the visit. The company took robust MT Master classes with him in his home studio, studied Reinforced Motor Function Application for Reformer in his Pilates studio, viewed breathtaking archival footage in the office, and shared conversation and meals together, many times prepared by Sean himself! At this level of dance, it is rare for an executive or producer to take this kind of time and effort to grant such intimate access to their home and family, something that Sean does with utter ease and hospitality. And the company is incredibly grateful! Sean has created a studio culture of inclusion; it is something that he lives and requires the company to exemplify as well. In Sean’s own words, “If you are not actively practicing and teaching love you are actively practicing and teaching hate.” This principle is embraced incredibly by NYIDE European Liaison and International German Choreographer Gregory Livingston, who extended his visit to the States after the New York Dance Festival last month. Sean (and in turn the whole company) calls Gregory “Maestro” “for the way he conducts my life.” Gregory Livingston has been integral to the development and continued growth of McLeod Technique. His emotional signature and near three decades of understanding and assisting Sean are an amazing example of commitment to friendship and the family you pick for yourself. Sean says, “Gregory ushers in a sense of calm and peace to every room he enters. He can tell me what to do. And that is good, every person needs to be told to be quiet from time to time.” It is clear that Sean and Gregory, brothers by bond, nurture and encourage one another in their careers and personal lives. Learning from two master teachers in dance and in life created an impact that will reach far beyond this weekend, leaving the company in high spirits, skilled in their knowledge, humble in their ability, and ready to spread that light back in New York City and beyond. NYC Dancer Ruth Rae and NYC Director of the New York Institute of Dance & Education Hana Ginsburg Tirosh are seen here studying McLeod Technique in a special class with founder Sean McLeod himself in Auburn NY. Kaleidoscope Dance Theatre Members came back to NYC from the New York Dance Festival fresh with inspiration having met the Legendary KDT Performer and McLeod Technique Gold Standard Teacher Lorienne Beals who was in from Italy! In the photo above: Lorienne demonstrates during a Reinforced Motor Function for Ballet Application Master Class with Master Teacher and Executive Producer Sean McLeod at the New York Dance Festival. Lorienne and Sean have a magical connection as she grew up and flourished under his tutelage. Today, Lorienne Beals is an international powerhouse in her own right, performs regularly in concerts and innovative projects in Italy, and is a leading expert in McLeod Technique and Reinforced Motor Function world wide. 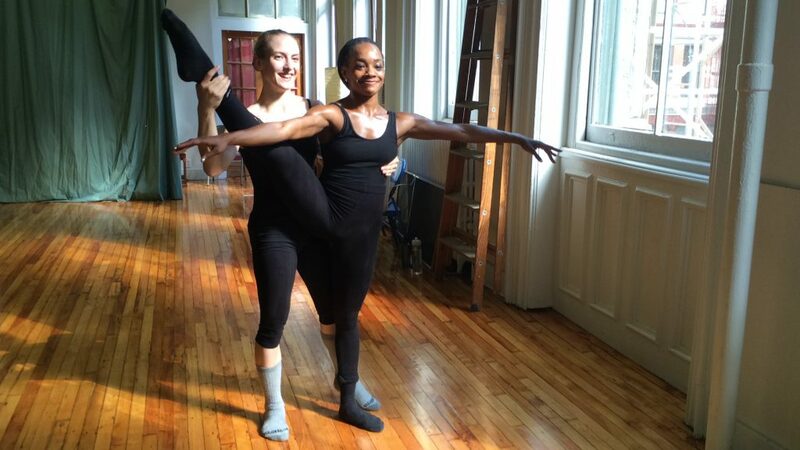 The Kaleidoscope Dance Theatre/Sean McLeod Dance Experience has had a wonderful week of McLeod Technique (MT) Open Classes and rehearsals in NYC! August has been absolutely beautiful and we have transferred that sunshine into the studio! 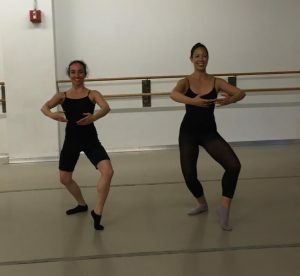 On Wednesday, NYC Director for the New York Institute of Dance & Education Hana Ginsburg Tirosh, taught Reinforced Motor Function for Ballet Application, leading dancers through MT biomechanics application that make ballet exercises just work. This RMF lens just works and is pain free. By focusing on the traditional aspects of classical ballet through a scientific understanding, dancers are able to perform classical positions in the healthiest manner. This extends the use of their knees, hips, and backs for many many years. In MT or RMF Tendu becomes Tendu Escape, employing action in both legs versus focusing on the working leg (the leg in the air) only. In a revelation of understanding, grande pliés in fourth and fifth shift the weight forward and equally into both legs. This properly aligns the knees (and the use of the knee) and suggests the crotch rest evenly between the two heels allowing for new strength source points to be engaged. This application arrests the erosion of knee integrity normally associated with grande plié fourth and fifth position exercises. 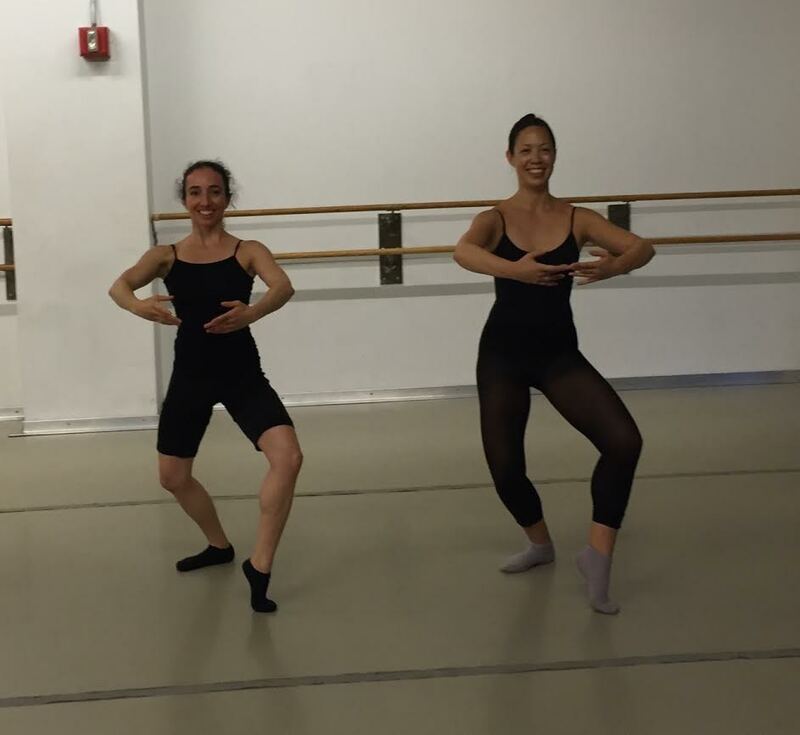 RMF for Ballet Application transforms all the static exercises traditionally taught at the barre and puts them into tangible exercises through Movement Integration. 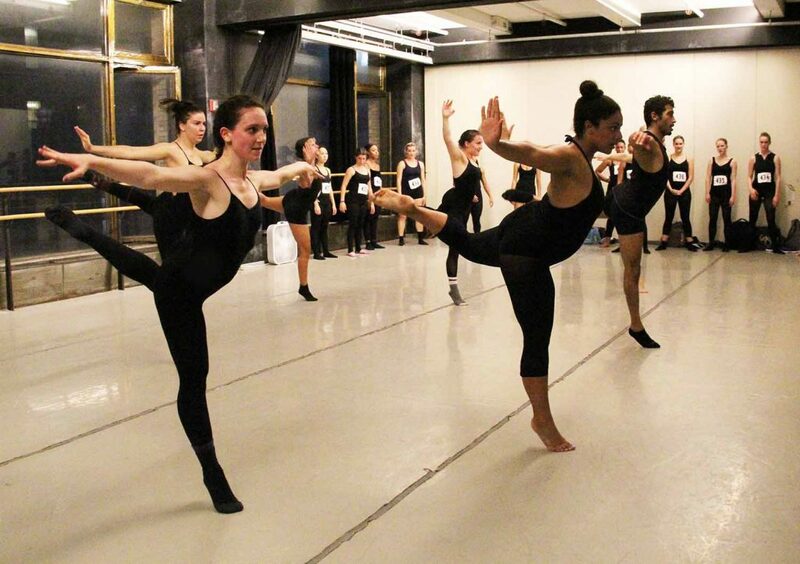 Movement Integration allows dancers to take the foundation steps of basic ballet and practice their use in actual motion as the first steps of ballet class. Amazement, smiles, and joy are equally if not more important! And after discovering these actualities smiles are abundant for sure. Below, New York Institute of Dance & Education Product Director and MT Expert Kierstyn Zaykoski reinforces KDT/SMDEx Company Member Crystal Fraser in NYC. Crystal is getting an opportunity perfect a MT Long Leg Lift exercise as she is reinforced by Zaykoski in the NYC class. Kierstyn also reminded her that “joy should be the standard!” in class and in life! Friday, NYC Director for the New York Institute of Dance & Education Hana Ginsburg Tirosh, led an extremely robust Reinforced Motor Function class. She had everyone sweating bullets in the first few minutes! Here, KDT/SMDEx Company Members Jillian Sawyer and Cassandra Bowser work together to find a sense of suspension for Jerami Kipp’s Least Traveled! Join the New York City MT Wave! Open McLeod Technique classes this week!